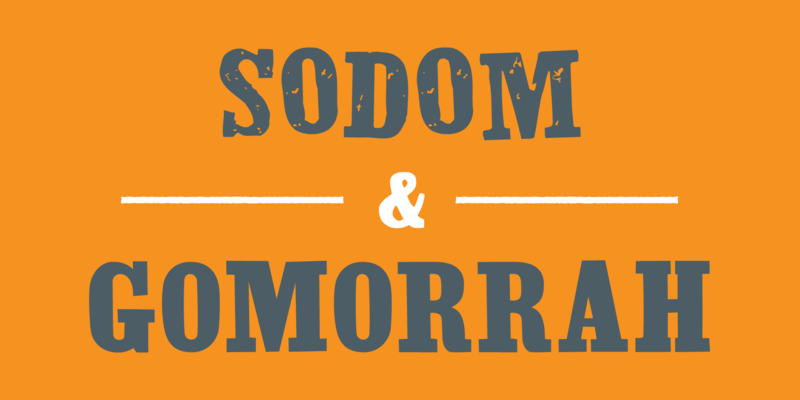 Sodom & Gomorrah - Chank Fonts! Sodom & Gomorrah is a revival font based on a letterpress type design released by the Hamilton Type Foundry of Two Rivers, Wisconsin in the 1930s. Designer Bill Moran of BLinc. Publishing printed the letterforms off the original wooden blocks, and the alphabet was then converted to font format by Darrel Austen and Mister Chank Diesel. This font package contains two fonts, Sodom & Gomorrah. Together, these fonts work as display type or at smaller point sizes. Gomorrah is based on the original design concept, with straight geometric lines, smooth curves and crisp corners. Sodom reflects how the font looks after printed with wooden letterpress blocks, with textured lines, slightly blurry corners, and spaces in the letters where the characters weren’t completely inked. The letters in Sodom also wiggle around a bit, as if the letters weren’t securely locked into place.